One of the small icons guiding walkers along the Pilgrim Way to Canterbury. Geoffrey Chaucer’s Canterbury Tales is the first substantial work of literature in English, although most speakers of English today need a translation or paraphrase to understand it. Written late in the 14th century, it was immediately popular. One hundred years after it was written it was among the very first works to be mass-produced (on a modest scale) using the new technology of printing. It has remained a widely-read classic of English literature into the present. Basically it is a collection of stories told by a group of pilgrims as they travel the Pilgrims Way from London to the holy tomb of Saint Thomas Becket in Canterbury Cathedral about 90 kilometres to the south east. The prologue to the Canterbury Tales describes the pilgrims as they assemble at the Tabard Inn in Southwark on the south bank of the Thames near London Bridge. More than 600 years later, on August 22nd 2015, Emmy and I dismounted from our donkeys in front of a smoke-filled hostelry in Southwark near London Bridge. The innkeeper appeared in the doorway accompanied by a mouth-watering aroma of roast goose and barley ale. I greeted him politely. “I bid thee good morrow, master,” I said doffing my cap and bowing low as Emmy modestly primped her wimple. Hmmm… let me rewrite that. Emmy and I disembarked from a train at London Bridge tube station and made the short walk to our rented apartment in Southwark, just minutes from London Bridge and the high-tech landmark of The Shard. Graham, the owner, greeted us and explained the 100-channel TV set and the high-speed Wi-Fi. He recommended some nearby Spanish and Italian restaurants and listed the supermarkets where we could buy pre-cooked, plastic-wrapped meals. A week later, having been catapulted out of London by train, we stood in a narrow lane in the village of Cuxton, six kilometres west of the regional centre of Rochester. We were facing the very modest entrance to the eastern half of the North Downs Way, a path that would partly piggy-back on the Pilgrims Way and take us to Thomas Becket’s holy tomb. 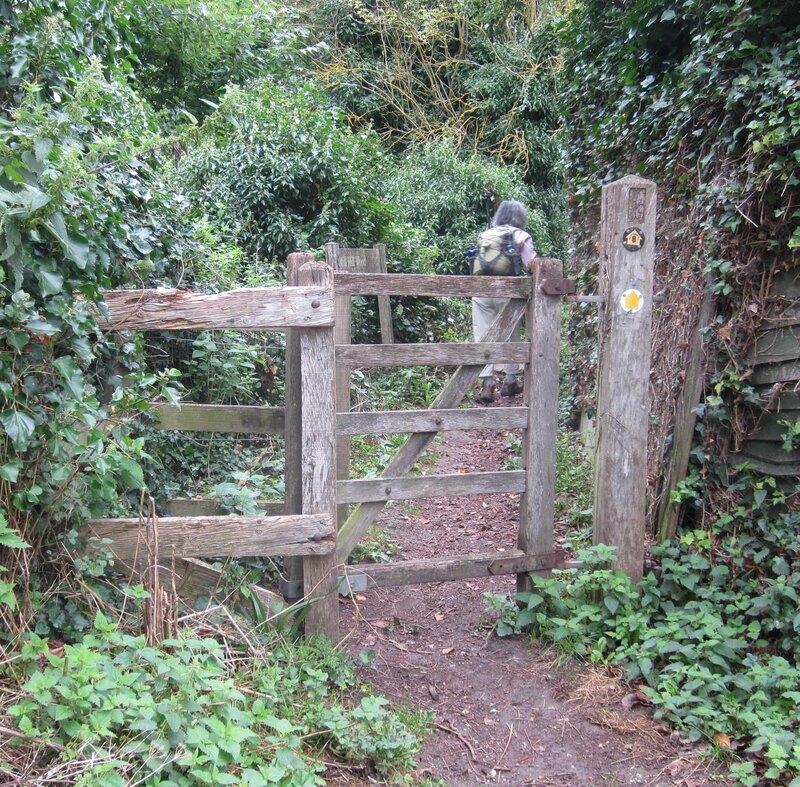 The unpretentious “kissing gate” at the start of the eastern half of the North Downs Way in Cuxton, near Rochester. Note the way markers nailed to the post on the right. We’re heading in the right direction. The pilgrim road to Canterbury fell into disuse after King Henry VIII launched an assault on the Catholic Church, its monasteries and its pilgrimage traditions in 1537. But it didn’t disappear altogether. Much of it was taken over for general transport purposes and later became asphalt highway. That’s why it is no longer possible to walk the entire length of the pilgrim path. It is simply too dangerous for pedestrians to mix it with modern traffic. Where possible the North Downs Way follows the old pilgrim path (or certain threads of the path), but whenever the path becomes highway walkers have to veer away from it and tramp over other ancient public trails and footpaths that lie like a cobweb over the rural landscape of England. Emmy walks into the light as we head towards Saint Thomas Becket’s resting place in Canterbury. After an hour’s walking through open fields and canyons of woodland under a warm overcast sky we drew breath at the enormous, multi-lane complex of four bridges that span the Medway River at Rochester. Chaucer’s pilgrims would have crossed the Medway at this point too, possibly spurring their frightened horses over the stone bridge that was completed there in 1391. From the Medway Bridge we set sail across the gently surging hills of Kent. Near the village of Blue Bell Hill, southeast of Rochester, we connected for the first time with the Pilgrims Way. Its broad flat surface offered welcome relief from the narrow track we had been treading. We stepped on and off the Way repeatedly as we headed towards Canterbury. 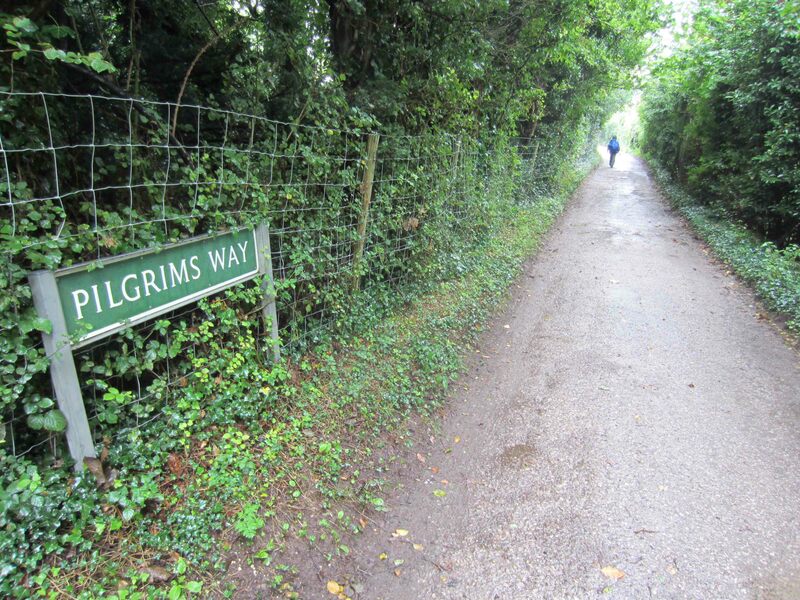 The wide,flat Pilgrims Way, a welcome sight for walkers who’ve been tramping rougher tracks. The modern iconography of pilgrimage at the Black Horse Inn in Thurnham. Everywhere there were reminders of the region’s pilgrim history. Some trackside icons pointing the way to Canterbury depicted a pilgrim wearing a cassock and brandishing a walking staff. Near the village of Harrietsham we came across a whimsical, life-size wooden carving of a pilgrim monk resting thoughtfully on a bench at the trackside. 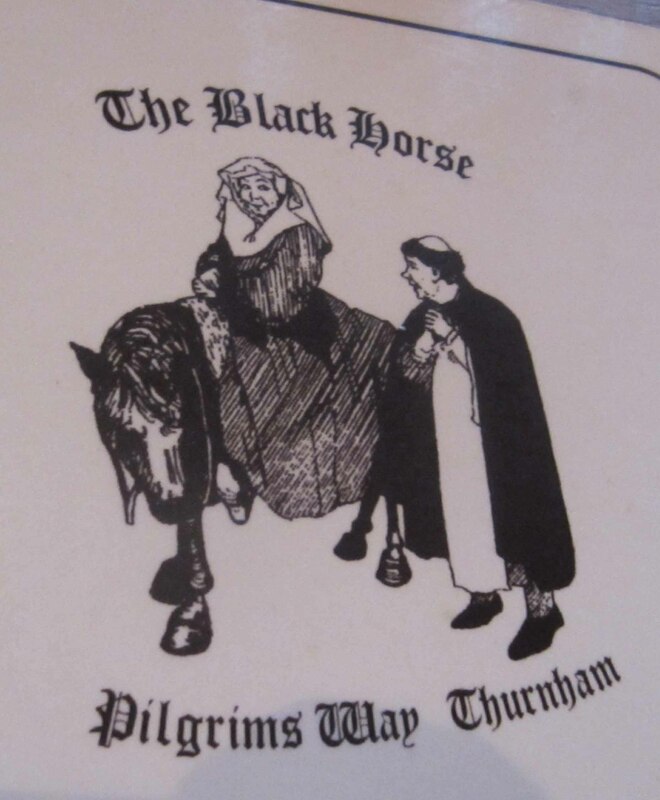 Medieval pilgrimage was a motif at the Black Horse Inn, our accommodation for the night in the hamlet of Thurnham about twenty-two kilometres from Cuxton. The inn’s cramped central room with its low ceilings, open fire-place, awkward nooks and crannies and crooked age-blackened beams was built in the thirteenth century. Dense strings of dried hops hung from the ceiling, a traditional decoration that is renewed from year to year. Perhaps medieval pilgrims in their grimy cassocks and straw-padded sandals had ducked their heads beneath this same bushy canopy. 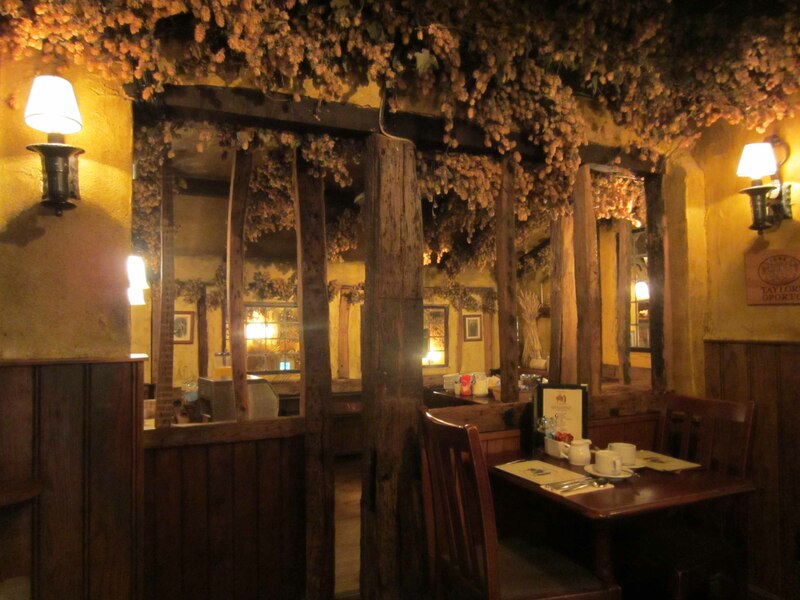 The thirteenth century interior of the Black Horse Inn with dried hops decorating its ceiling beams. As I tucked in to my tasty dinner of slow-cooked lamb shank and minty mashed potatoes an unwelcome echo from The Canterbury Tales turned up in my head. It came from the knight’s tale. “The world is nothing but a thoroughfare of woe down which we all pass as pilgrims…” said the Knight. “That’s why we are all here,” said the Franklin, interrupting the knight. “God give us grace and a good death.” This was the Reeve, crossing himself. “Amen to that,” the Knight replied. I didn’t echo the Amen. Rather I turned my attention to the dessert of sticky date pudding and whipped cream. Too much reading can make you gloomy. An hour later I was cursing Geoffrey Chaucer, the madness of religious pilgrimage and the sheer unpleasantness of walking in Britain’s summer. I skidded down a mud-lubricated trough that someone – probably a bright-eyed hiking fanatic – had labelled a “path”. A path? It was a water-filled rut. Thick slimy hamburger-patties of dirt stuck themselves to the bottom of my boots as the “path” made vertical zig-zags over steep rain-sodden ridges. I looked at Emmy and noticed a film of mud creeping up her water-proof leggings. I was no better. An unscheduled wallow in a mini-bog had left dirt all over my leggings, backpack, and even through my hair. Already I sensed I was in for one of the most trying days of walking I would ever experience. 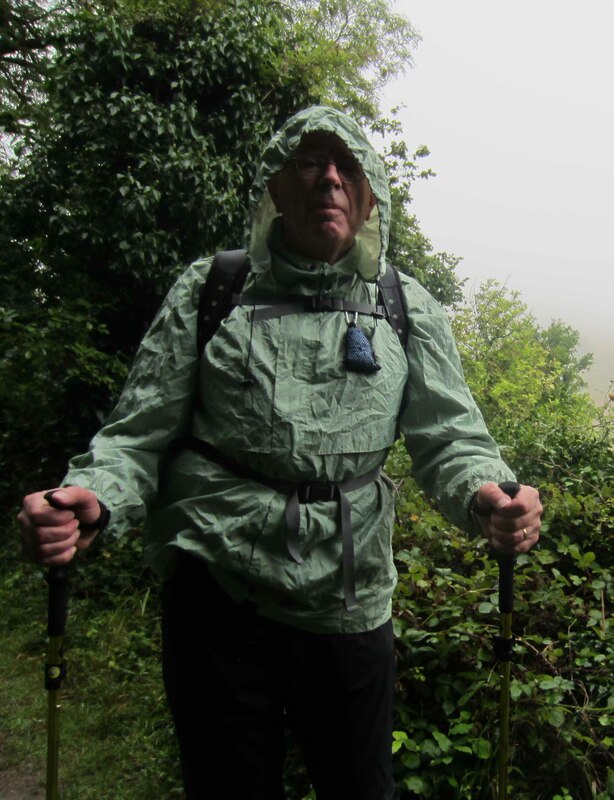 A rain zombie haunts the Pilgrim Way just east of Thurnham. 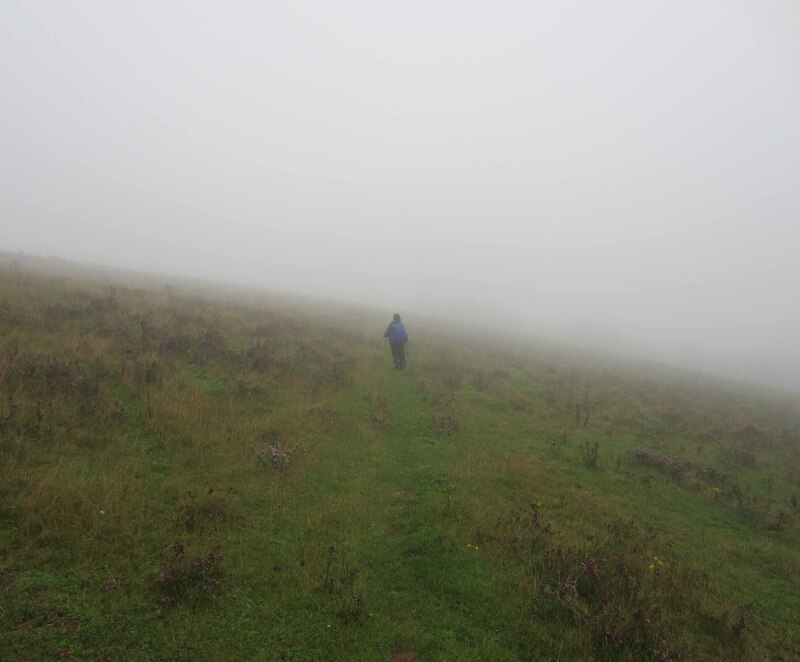 Emmy disappears into the misty rain as we struggle towards Charing. As the morning passed the rain thickened. Mist crowded in on us. Kent’s fabled “outstanding natural beauty” retreated, became blurred, and eventually disappeared altogether behind a veil of mist. At times we were walking through a grey-white tunnel where the only reality was foot before foot, plus ghostly branches and the struggle to stay upright. A break for lunch brought little relief. Somehow the rainproof cover over my backpack had disappeared, probably torn off by branches during a stooping detour around a mud hole. My backpack was limp with water and my sandwiches were too. But I ate them and felt better. The walk was indeed (as Chaucer’s knight put it) “a thoroughfare of woe” but after sandwiches and a mouthful of chocolate the woe was pretty bearable. And the rain had started to ease. 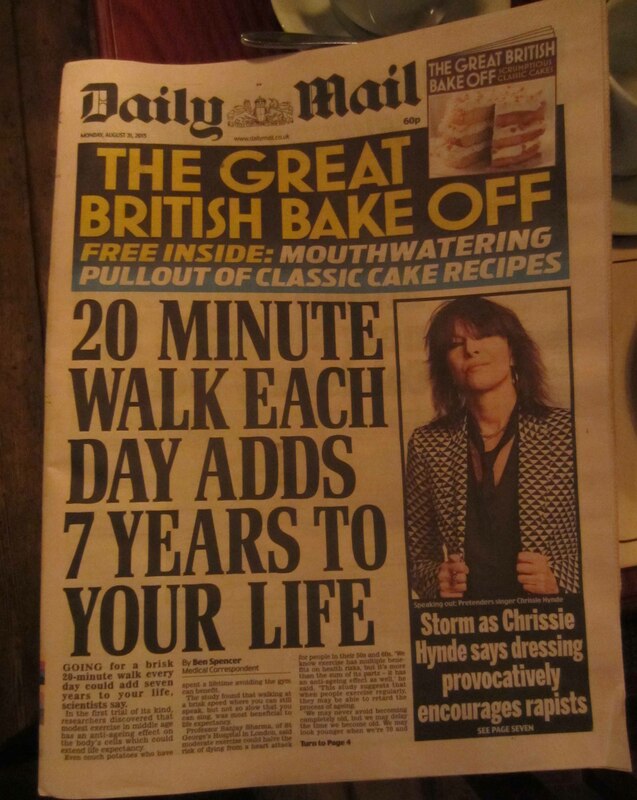 Hmmm… after a day of walking through steady rain, this headline is not much consolation. 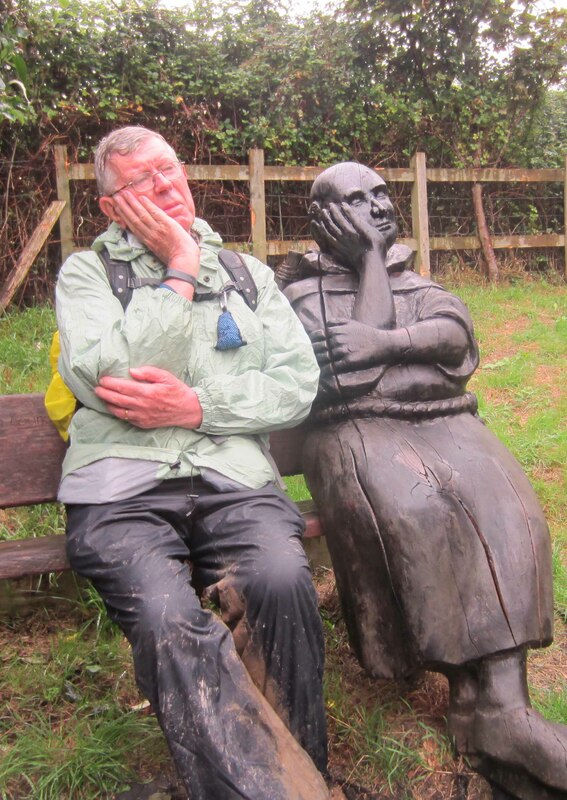 I contemplate the downside of pilgrimage along England’s Camino. Apparently my medieval alter-ego had similar doubts. ** The quotes from The Canterbury Tales come (with a few tweaks) from Peter Ackroyd’s wonderful prose paraphrase The Canterbury Tales by Geoffrey Chaucer translated and adapted (Penguin 2009). 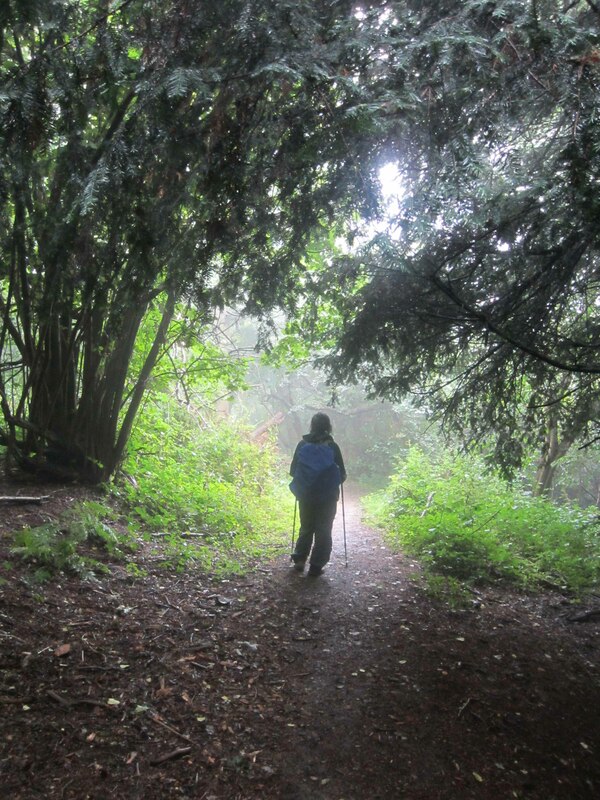 This entry was posted in North Downs Way and tagged Camino by George Quinn. Bookmark the permalink. Should have come to Burgundy!